Anyone who cooks should own at least one whisk. Whisks come in several different shapes and sizes, because each is designed for a specific purpose. There are those that have fairly thick and rigid wires which are great for stirring sauces and puddings. And then there is what we call a balloon whisk. The wires on a balloon whisk bulge out at the ends and they’re very thin and flexible. That shape and flexibility makes a balloon whisk the perfect tool for whipping cream and beating egg whites. It’s specifically designed to put a lot of air into whatever your beating. 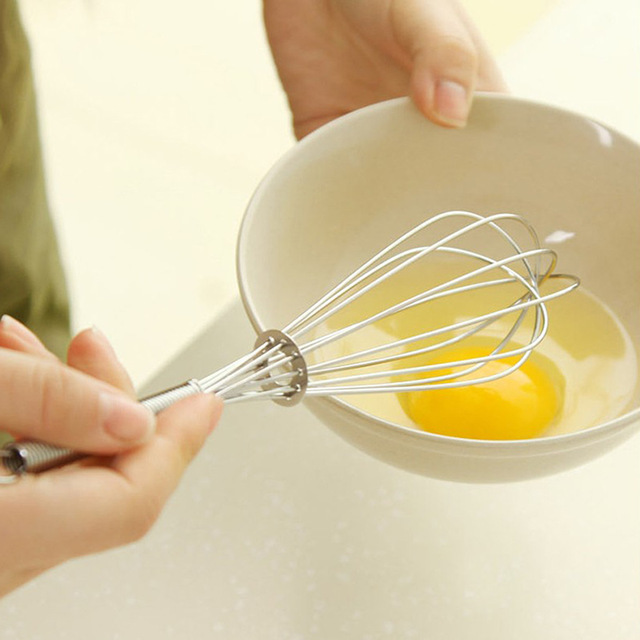 If you are handy with a whisk, and have the right whisk, it can even replace an electric mixer. Here’s a whisking technique I recommend which lets you whisk anything using just one hand while freeing up the other to pour or add more ingredients. This is especially useful when you’re making a vinaigrette dressing and want to slowly add oil with one hand while whisking with the other. Here’s how to do that. Take the bowl you’ll be mixing or whipping things in and find a pot or kettle that it can sit inside of. It doesn’t have to fit completely into the kettle (in fact it is preferable if it doesn’t) but a good portion of the the base should be able to rest inside. Then take a dishtowel and set it between the kettle and your mixing bowl. What the towel does is hold the bowl in place so it doesn’t move around on the counter as your whisking. It’s a great technique. You free up a hand to do other things because the kettle and towel are holding the bowl. Try it some time. It’s a great help when making dressings, whipping cream or beating egg whites.